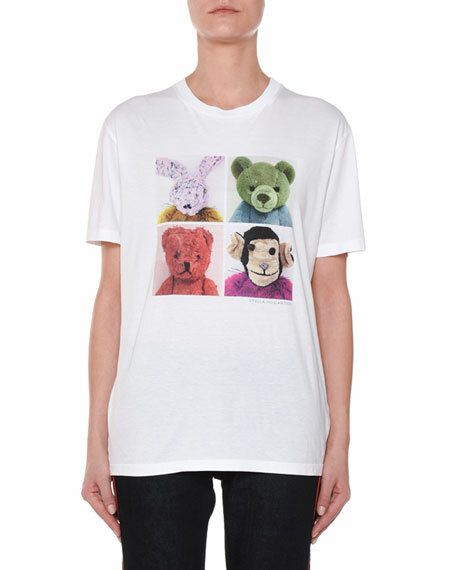 Stella McCartney T-shirt with 4-square stuffed animal graphic-print. Made on Grand T-shirt with contrast topstitching. "S.W.A.G" patchwork on arm. Crew neckline. Long sleeves; slit cuffs. Relaxed fit. Pullover style. Rayon from bamboo/cotton/spandex. Made in USA of imported materials. Model's measurements: Height 5'10"/177cm, bust 33"/84cm, waist 25.6"/65.2cm, hips 35.8"/91cm, dress size US 2-4/FR 34-36. Off-White c/o Virgil Abloh?? T-shirt in jersey with floral graphic print on chest and back. Partially covered "Woman" typography detail on back. Crew neckline. Short sleeves. Semi fitted. Straight hem. Pullover style. Cotton. Made in Italy. 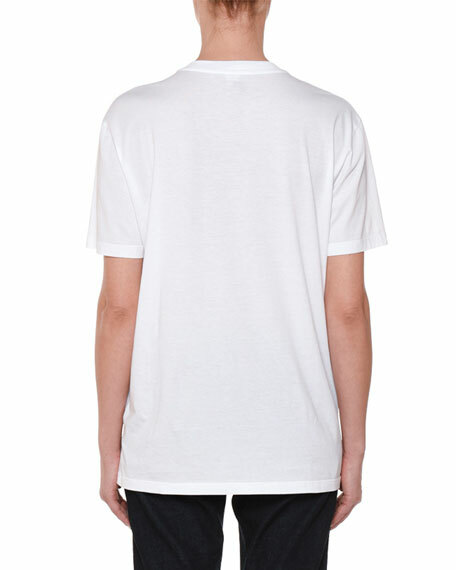 Opening Ceremony tee with ombre logo screen print on front and back. Crew neckline. Short sleeves. Straight hem; side vents.